Location: East end of the city of Orange. From the 55 freeway, take the Chapman exit and go east for 2 miles. Take a left on Cannon St. and go 1.3 miles. Take a left on Patria Court and park on the side of the street. Alternately, take the 91 freeway to Imperial Highway and drive south for 3.9 miles (Imperial becomes Cannon along the way) and turn right onto Patria Court. Like its parent park Santiago Oaks, Orange’s El Modena Open Space is one of Orange County’s most accessible natural areas. The good news is that for those who live or work nearby it’s as convenient a workout as you are going to find – with views (on clear days) that extend to Catalina Island, downtown L.A. and even the Hollywood Sign. The price of this easy access, besides the noise of traffic on the surrounding streets, is litter. Fortunately trash cans positioned at both ends of the trail make it easy for conscientious hikers to pack it out. Hiking counter-clockwise, as described here, gets the steepest part of the route out of the way first. 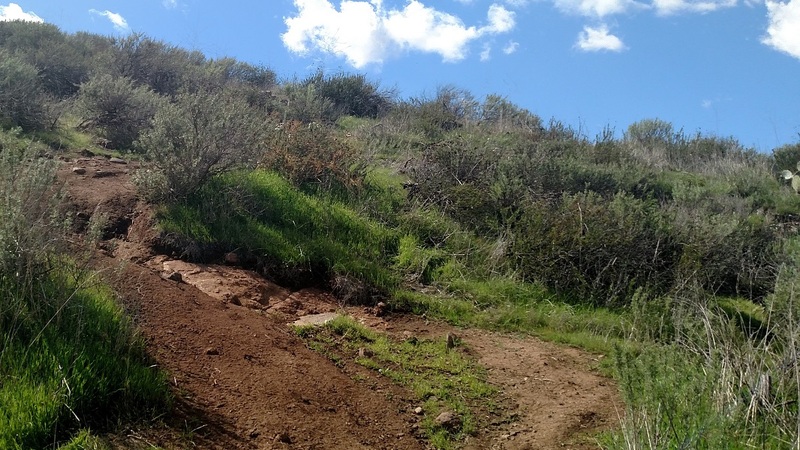 From the trail head on Patria Court, follow the trail through a shallow trench paralleling Cannon before making a sharp climb to the north-south running ridge. Once on the ridge, you continue your ascent, ultimately climbing about 450 feet in 0.6 mile. Your climb ends at the first and highest of three separate bumps you will encounter along the ridge. 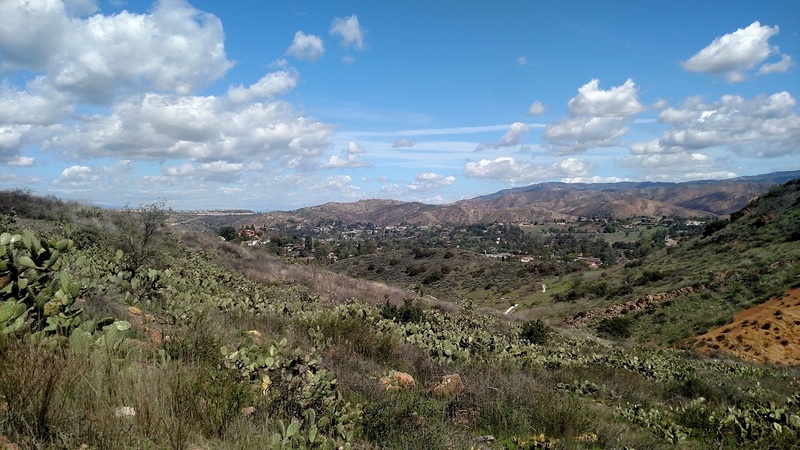 The views are impressive including the Santa Ana Mountains to the east and suburban Orange to the west. If visibility is good, the ridge of Cahuenga Peak and Mt. Lee can be seen. The Hollywood Sign appears as a thin white line beneath the peaks. The view may also include Catalina Island, the Palos Verdes Peninsula, downtown Los Angeles and the round dome of Mt. Lukens. After dropping off the bump, the trail continues south along the ridge. A few other trails, mostly unofficial, branch off; there is one route that heads down to Cannon St. for those who want to shorten the hike. After descending from the second bump, you reach a “Y” junction. The left fork also heads to Cannon St. while the right fork climbs to the third bump. 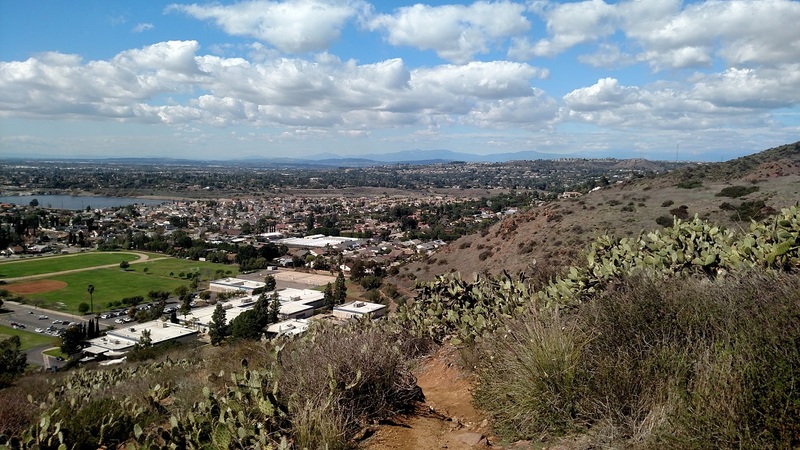 From here, look for a trail descending steeply off the west side of the ridge toward Santiago Charter Middle School. 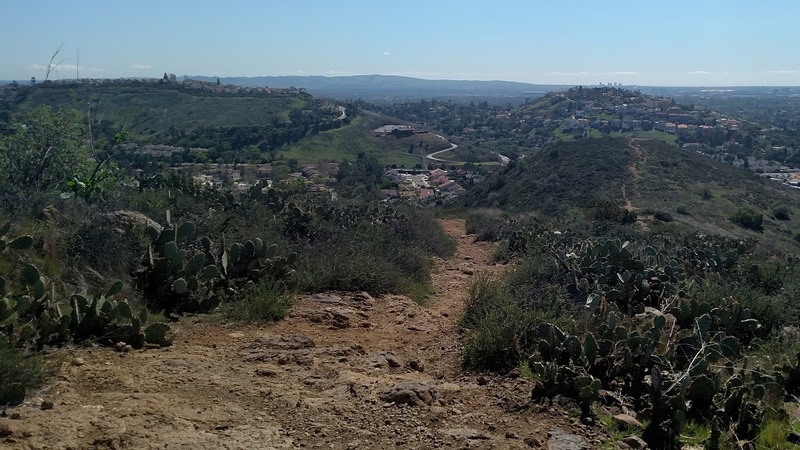 After dropping almost 200 feet, the trail bends back toward the east and meets Cannon St. 1.4 miles from the start. From here, simply follow Cannon north for one mile back to the starting point. You can also pick up one of the trails you saw earlier from the bottom end, follow it back to the ridge and retrace your steps from there.